Flip a coin from your notification center. Is there a better alternative to Coin Flip? Is Coin Flip really the best app in Productivity category? Will Coin Flip work good on macOS 10.13.4? 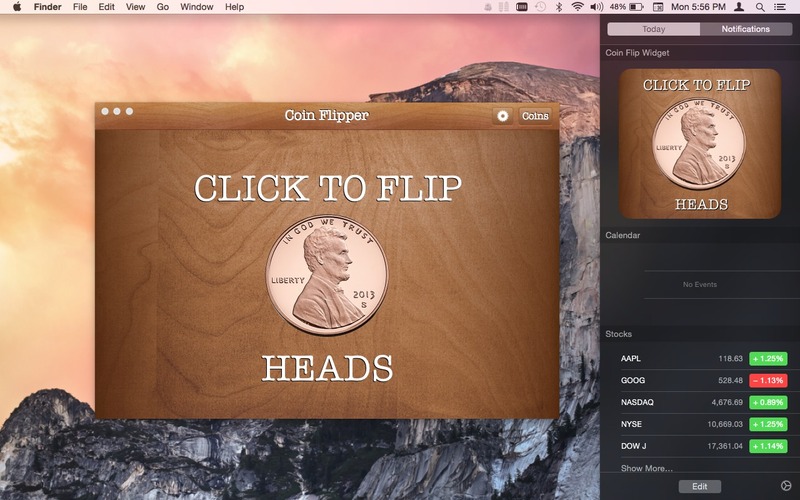 Coin Flip is the first coin flipping widget for your Notification Center. Easily add the "Coin Flip Widget" in the Notification Center and flip a coin at any time! You can also flip a coin from the app itself. Coin Flip needs a review. Be the first to review this app and get the discussion started! Coin Flip needs a rating. Be the first to rate this app and get the discussion started!